Kent Hehr (left), shortly after being sworn in as an MLA in 2008. 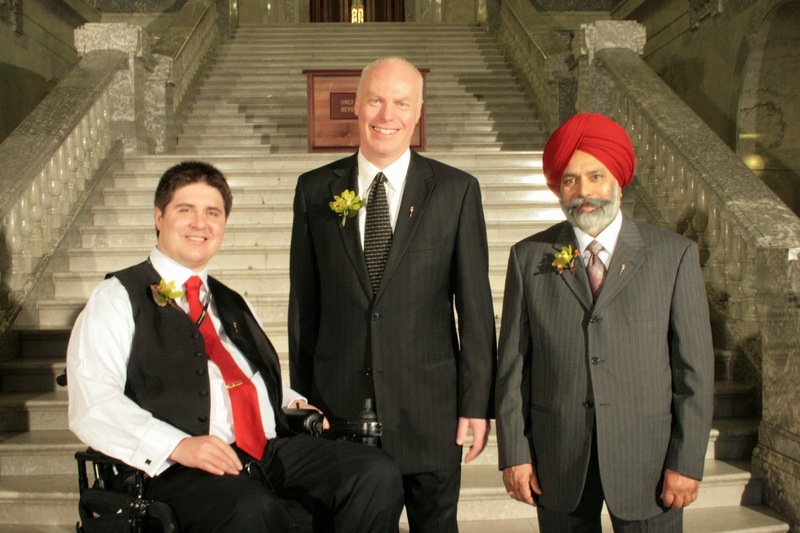 With him are former Official Opposition Leader Kevin Taft (centre) and Darshan Kang, also a new MLA in 2008 and, like Kent, running for the federal Liberals in Calgary in 2015. Many of you have noticed that I don't write much about politics anymore; it's because I was pretty burned out after my six and a half years with the Official Opposition in Alberta. But when I learned that Kent Hehr, currently the Alberta Liberal MLA for Calgary Buffalo, wants to become the next Member of Parliament for Calgary Centre, I wanted to help. Being in politics for a few years can make you a little bit cynical about politicians, but Kent really is different, and he proved that every day I worked with him. So when the opportunity arose to write a short testimonial about Kent, I was happy to oblige. After you click that link to read about my experiences with Kent and why I think Canada will be a better place with him on Parliament Hill, I hope you'll consider donating to Kent's campaign. I donated $400 last year and I'll donate again this year. If you care about evidence-based decision making, investing in public institutions, human rights and looking out for the little guy, I urge you to learn more about Kent and to follow his campaign - especially if you live in Calgary Centre. He won't let you down.